As in many countries in transition, reform of the judiciary has been a major issue in Georgia. The country has gone through a number of reforms since the early 1990s. After the bitter September 2012 prison abuse scandal, the post-2012 election period saw a renewed attempt at reforming the judiciary by the newly elected government. This attempt involved a series of legislative changes in 2012, 2013 and 2014. While these changes might have passed unnoticed on the part of the general public, the high profile trials and indictments of former top officials, including President Mikheil Saakashvili, the Minister of Internal Affairs Vano Merabashvili, Mayor of Tbilisi Gigi Ugulava, Defense Minister Davit Kezerashvili and Chief Prosecutor and Minister of Justice Zurab Adeishvili have certainly attracted the public’s attention. As the prison scandal, judicial reforms and trials continue to make headlines three years into the new government, it is interesting to look at the dynamics of public trust in the judiciary in Georgia and to explore factors that could be linked to it. Using data from CRRC-Georgia’s 2014 survey Attitudes towards the Judicial System in Georgia, funded by USAID through the East-West Management Institute, this blog post explores Georgian citizens’ trust towards the judiciary by looking at three factors that are commonly used in the literature to explain levels of trust in public institutions: (1) perceived performance (Askvik, Jamil and Dhakal, 2011); (2) fairness (Rothstein, 2004; Mishler and Rose, 1997); and (3) trust in incumbents (Sztompka, 1999). As Georgian citizens indicate that courts and judges are one of the first things that come to their mind when thinking of the judiciary, we refer to courts in this post to represent the judiciary. In order to explore how assessments of the courts’ performance are associated with trust in courts in Georgia, we look at trust in courts by perceived court performance. The latter is measured by the answers to the question asking how Georgian courts work after the 2012 Parliamentary Elections. The chart below shows that half of those that reported better performance also reported trusting courts, while roughly the same share (54%) of those who reported worse performance reported distrust in courts. Unsurprisingly, the data proves that the more people perceive that courts are performing well, the more they tend to trust them. This conclusion is also backed by correlation analysis which shows significant, but relatively weak correlation between these variables. Note: During the analysis, the answers to the question “How much do you trust or distrust courts?” were re-coded from the 10-point scale used in the questionnaire into a 3-point scale where original options 1 through 4 were combined into “Distrust,” options 5 and 6 were combined into “Neither trust nor distrust” and options 7 through 10 were combined into “Trust.” Options “Do not know” and “Refuse to answer” are excluded from the analysis here as well as in the rest of the analysis. Answer options to the question “How did the Georgian courts work after the 2012 Elections?” were re-coded as follows: “much better” and “somewhat better” into “better”, and “somewhat worse” and “much worse” into “worse”. Fairness is another factor that helps to explain the level of trust in courts. It can be measured through the level of (dis)agreement with the statement “All people are equal before the law in Georgia.” Similar to the previous chart, the chart below shows that about half of those agreeing that everyone is equal before the law in Georgia trust courts, while half of the people that disagree with the statement distrust courts. Therefore, the more that Georgians agree that all people are equal before the law in Georgia, the more they tend to trust courts. The correlation between these two variables is also significant and relatively weak. Note: The answers to the statement “All people are equal before the law in Georgia” were re-coded from the 10-point scale used in the questionnaire into a 3-point scale where original options 1 through 4 were combined into “Disagree,” options 5 and 6 were combined into “Neither agree nor disagree” and options 7 through 10 were combined into “Agree”. Finally, the literature suggests that trust in an institution is an aggregation of trust in an institution’s incumbents i.e. the people that are employed or that represent an institution. Here, the perceived level of judges’ fairness, measured by (dis)agreement with the statement, “Overall, the judges are fair in Georgia,” serves as a window into trust in court incumbents. Unsurprisingly, 69% of those that agree that judges are fair report trusting courts, and 63% of those that disagree report distrusting them. Thus, the more people believe judges are fair, the more they tend to trust courts in Georgia. This conclusion is also backed by correlation analysis that showed significant and strong correlation between Georgian citizens’ trust in courts and their assessment of judges’ fairness. Note: The answers to the question “To what extent do you agree or disagree with the opinion that Georgian judges are fair?” were re-coded from a 10-point scale used in the questionnaire into a 3-point scale where original options 1 through 4 were combined into “Disagree,” options 5 and 6 were combined into “Neither agree nor disagree” and options 7 through 10 were combined into “Agree”. 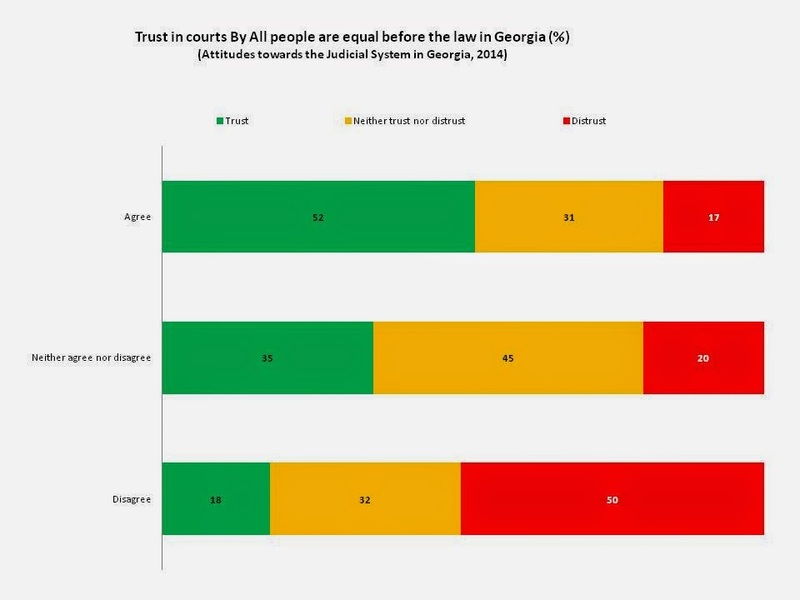 This blog post explored associations between levels of trust in courts in Georgia and some factors that are considered important to the level of trust in public institutions. The analysis found that all three factors discussed – perceived performance, perceived fairness and trust in incumbents – can help explain levels of trust in the judiciary in Georgia and that they can potentially serve as explanatory variables for further analysis of trust in courts. Unsurprisingly, the charts presented above display an almost symmetrical compatibility between (dis)agreement with statements and levels of (dis)trust, while correlation analysis also backed the results. Still, it would be interesting to explore the effects of political discourse, especially when emphasis is placed on “change” and “reform,” in order to see whether perceptions are affected by personal experience with institutions or by the general climate which emphasizes change in everyday public discourse. What other factors are at play when thinking about trust in the judiciary in Georgia? Join in the conversation on the CRRC-Georgia Facebook page or in the comments section below.